Is TV Harming Your Kids? | Breezy Mama Breezy Mama - Expert parenting advice, celebrity interviews, product reviews for kids, moms and babies and more! Is TV Harming Your Kids? Listen, I’m pregnant with twins and have a 2, 4, and 6 year old home with me alllll summer with no camp, nanny or sitter. And my mom took a job (the nerve!). Other than trading off with other Mamas (I take their kids and mine one day, they get my sweet revenge, um, I mean, the crew another), it’s alllll me. To say that TV is my best friend some days just might be an understatement. But how much is too much? And what exactly are the negative effects? And are there any pros (in addition to my sanity)? 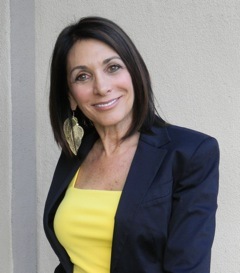 Breezy Mama turned to two experts — Nancy Mramor Ph.D., an educational, health and clinical psychologist, and Media Resource and Dr. Elaine Fogel Schneider, an award-winning licensed speech and language therapist — to get the truth about television watching and kids. So is TV watching for kids THAT bad? Dr. Nancy Mramor: TV watching is something to do with caution. If programs are age appropriate, and send children messages that you would want your children to have, then the watching can be entertaining and instructional. Children learn more when an adult watches with them and helps them with program understanding. Watching with your children to be sure they understand what they saw and helping gain instructional content by checking with them to see if they got the instructional pieces is important. Be sure that any messages you don’t agree with are discussed. For example, discuss commericals or shows that associate being “cool” with name brand jeans or tennis shoes. Be sure to discuss consequences of character’s actions. Children are likely to repeat behaviors that had positive consequences. For example, if they see someone break into a building to get something to help someone, they may see the action as positive. Be sure to discuss such programs. Commercials are one big thing to consider. They pitch junk food, sugary cereal and expensive toys during children’s viewing time. Violence – kids can sometimes get out their own aggressive instincts by watching TV aggression, but are also more likely to act aggressively immediately after viewing if an opportunity arises. This could be an issue if they watch with siblings because there is someone there for them to direct aggression toward. Obesity is a national epidemic. 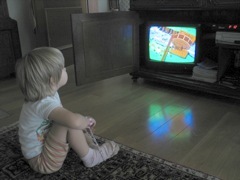 TV Watching is inactive, and while it does not cause obesity, children are not being physically active during viewing. It can contribute, along with video games and movies, to children getting used to fast paced viewing. As a result, they may not develop sustained attention span and concentration. Modeling – Kids become like the characters they see. The first important writer on the topic of TV, Marshall McLuan said, “We become what we behold.” He referred to what we watch on TV. Children may repeat the exact behavior of a character or just a secondary characteristic such as clothing, language or make-up. This is both a Pro and a Con because children become socialized through TV and so it is a part of how they develop their identify. Dr. Elaine Schneider: American Children who watch three hours of television a day will see 4,380 acts of altruism and 15,330 acts of violence each year (www.Princeton.edu/future of children/publications/journals/article). Also, television should not be a substitute for interacting, playing, exercising and reading. Dr. Nancy Mramor: Again, modeling – (see above). Choose to expose them to good models. It is a good way to unwind, but children need to learn to watch consciously so that they don’t experience “TV Hypnosis,” an inactive state where they just take in what they see. Parents can help them learn how to pay attention to what they see, even when they are watching to relax. Stress Management – Children have demanding schedules and need some down time. The rules for making the time productive apply to the above points on unwinding. It is one of the most powerful instructional tools available and so it is a double edged sword. Sesame Street was one of the most powerful positive influences in children’s TV and was translated into 70 languages! Dr. Elaine Schneider: ABSOLUTELY! When properly monitored by parents, TV has educational and entertainment benefits. 0-2: American Academy of Pediatrics says NO TV! Can violence – and I’m not talking Pulp Fiction, but just Sponge Bob Square Pants – have a negative effect on kids? Dr. Nancy Mramor: Again, violence – kids can sometimes get out their own aggressive instincts by watching aggression on TV which is not a negative thing, but are also more like to act aggressively immediately after viewing if an opportunity arises. This could be an issue if they watch with siblings because there is someone there for them to direct aggression toward. Dr. Elaine Schneider: Yes! Watching certain shows can have an upset on a child, even if the character is a cartoon. Solving problems with aggressiveness is not the type of behavior that we want a child to emulate, even if the person doing the aggressiveness is a cartoon. Are there any shows that are aimed at kids, but you feel should be avoided? Dr. Nancy Mramor: The following should be avoided but may be acceptable in some cases IF they are viewed with a parent who can moderate what is on the screen. Actually, anything excessively violent, including video games and movies as well as TV. Anything that promotes any kind of negative stereotype. Programs that show mean, selfish, overly privileged lifestyles or bullying behavior. It’s hard to pick out certain programs because most contain mixed messages, at times positive and at other times negative. Too much Science Fiction. Star Wars and Avatar have powerful positive messages but too many horror movies do not and cause trauma and nightmares! For example, I have seen so many children have nightmares after watching the Nightmare on Elm Street series and Freddie Kruger. Dr. Elaine Schneider: Yes. Sponge Bob Square Pants and other cartoons that depict aggressive behavior should be avoided. Attachment to characters occurs during the preschool years. Do you have any shows you recommend for kids and, if so, why those shows? Dr. Nancy Mramor: I have mentioned Sesame Street and almost anything in the “children’s block” on PBS. The Disney channel and cartoon channels have some mixed messages but are worth viewing with a parent. Watch out for MTV and VH1- lots of highly sexual scenes and lyrics! Great if they watch Discovery and Learning Channels but documentaries have to be viewed critically. Often even the History Channel may have two documentaries with opposing views. Comedies that show kids what is and is not really funny! Dr. Elaine Schneider: I like to recommend some of the everyday favorites, that seem to be remaking themselves, such as Sesame Street. It is educational, multi-cultural, and entertaning. The formula they have is one of success that is timeless. I actually do try to avoid turning on the TV but some days rely on it. I feel like after watching, my 4 year old has heightened emotions (cries more easily, etc.) – am I crazy? Dr. Nancy Mramor: Depends on what he is watching. I would watch to see if he acts this way after specific programs or all programs. He may be a child who is getting too much stimulation from the screen. Dr. Elaine Schneider: No, you are not crazy…you are very astute. Emotions may become heightened, as the brain doesn’t make the distinction between what is real and what is not…and so transference occurs and your son did not separate himself from the character he was watching. My 4 year old and 6 year old don’t nap and even when they appear tired, I can’t convince them to, so I actually turn on the TV on days they’ve had a lot of activities in order to get them to relax and rest – am I fooling myself or are they actually getting rest? Dr. Nancy Mramor: Sure, it is relaxing, but it is also hypnotic, so be sure that what they watch is positive. What are your feelings about DVD players in cars and turning them on for short trips? Dr. Nancy Mramor: No problem as long as the rules above apply. Kids should not watch movies in the car that they would not be allowed to watch at home. I once sat in a lecture by a book author who was also a pediatrician and she talked about how kids should never watch TV. Then she discussed how her parents always sat her in front of the TV. The only thing I got out of that was that she sat in front of the TV non-stop and became a doctor and best selling author. TV can’t be THAT bad, right? Dr. Nancy Mramor: There are a large number of books about the evils of TV. Having researched this and NOT been traumatized the way the pediatrician was, I would say that TV has incredible power to teach both positive and negative things. I have written a lot about this lately so it is a very broad topic. I even did a doctoral dissertation on the subject so I could go on and on! Each month I offer RxTV in my newsletter (www.drnancyonline.com) to give some pros and cons for the TV viewing for this month’s newsletter topic (humor, food, happiness, etc.) and I link the topics to how to approach TV viewing in each category. Dr. Elaine Schneider: She may be a unique case… do we know if her parents discussed any of the shows with her after she saw them? Do we know what she was watching? And the length of time specifically? Quality content has an influence on the child along with the amount of time spent watching TV. Don’t laugh, but another concern I have is that if I were to eliminate TV altogether, my kids would be missing out on a big chunk of pop-culture. For example, if you make a Three’s Company or Brady Bunch joke, I’ll likely get every reference. And I’m proud of that (LOL). How can I not fry their brains but allow them the enjoyment of entertainment? Dr. Nancy Mramor: Where would we be without the Brady Bunch or Three’s Company? They are important parts of our culture and reflect and even drive our culture! Would TV have become more open if All in the Family hadn’t come along, changing the family stereotypes from the perfect family to one that disagrees, lives together despite conflict and laughs and cries along the way? This is an area where I could really go on and on because I truly believe that the shows of the 60’s, 70’s and 80’s shaped the changing world and that the world shaped those shows! They are gems and thanks to Nick at Night and TBS as well as many other channels we can still see some great shows. Reality shows have taken over the screen since the 2000’s, but as long as children know that they are not reality and are just less scripted fiction, then the same viewing rules apply. 1. Preview shows the your child desires to see. 2. Analyze the show for educational and entertainment purposes. 3. Monitor the media content. 4. Record shows and remove the commercials. 5. Use TV as a way of engaging your child, so you can have cuddle time as you are watching one of the entertaining shows; you can ask questions about the characters…or the families…i.e., ‘How many children are in the Brady family? What are their names? Which one is your favorite? Why?’ etc. Regardless of your feelings on TV, is taking the kids to the movies okay? Dr. Nancy Mramor: The exact same rules apply. Most movies end up on TV eventually! Dr. Elaine Schneider: ABSOLUTELY! Movies can offer education and entertainment also in a positive way and you can monitor the movies you go to. Remember to engage your child by preparing them before they see the movie, i.e. if the movie is about Penguins….you can take out books describing penguins, describing and showing where they live, the temperature of their habitat, etc. After the movie is over you have the opportunity of sharing and engaging your children to tell you what they liked best about the movie, what they thought of the various characters, who was their favorite, if they can recall the sequence of events, etc., etc. Anything else you would like to add or share on TV and kids? Dr. Nancy Mramor: As I said, I could go on and on, but I would say as someone with highly positive ( and some highly negative) viewing experience, that I maintain my neutrality as often as I can, viewing as an open-minded viewer, seeing if I want the message on the screen or not. I recommend the same strategy to others. Dr. Elaine Schneider: Really having a TV is not the problem… it is what you do with a TV that can cause problems. Be the pilot of your own ship. You are your child’s guide. You are the leader of the troop. You set the rules. Most of all…you are the parent. So parent…your kids are counting on you!! 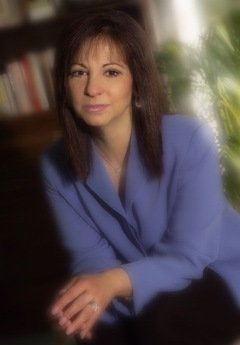 Her book, Massaging Your Baby- The Joy of TouchTime® may be ordered on line at her website or on Amazon.com —click here! Lol – I’m totally with you about the importance of exposing them to pop culture. In fact, on several occasions I’ve thought about how I’ll catch them up on all my favorite movies! We have a huge Dora fan in our house – I actually think she’s been a highly positive influence. My daughter is adventurous, loves animals, is incredibly sweet with her baby brother and knows quite a bit of Spanish! I let her watch a few episodes and then we go out or change rooms or something to encourage her to start another activity.